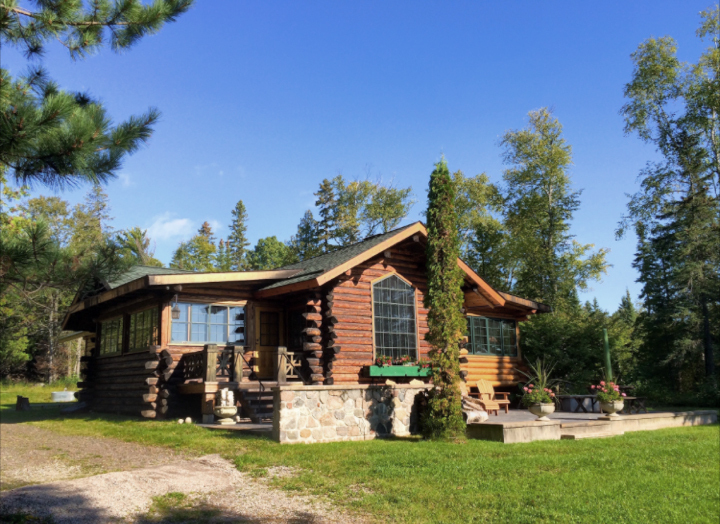 This cozy log cabin was built in 1935 by Edward C. Snyder, a locomotive engineer for the Duluth, Missabe & Iron Range Railroad, and his wife Mary. It is a kit home, one of dozens of ready-to-assemble models offered by the Page and Hill Co. of Minneapolis. This specific cabin is pictured in the company’s 1930s catalogs, presented as the “North Shore” model. Page and Hill cabins were designed by Minnesota architect Chilson D. Aldrich, who had written a popular book, The Real Log Cabin, in 1928. The book was reprinted many times, including a 1994 version with commentary by Harry Drabic, who still owns Aldrich’s original North Shore cabin. The current owners have kept the original portions of the cabin virtually intact. The kitchen cabinetry is original, as are all the windows. Originally built with one bedroom and one bathroom, the current owners have added a sunroom and a rear addition with two bedrooms and bathrooms on two levels.